Add to your gift list for Raksha Bandhan, this Arresting Compilation of Rakhi Tidbits that is teamed with a free Fancy Rakhi, Roli Tilak and Chawal. This Hamper is comprised of 100 gms. Assorted Dry Fruits, 200 gms. Haldiram Kaju Roll, 200 gms. Haldiram Soan Papdi, 200 gms. 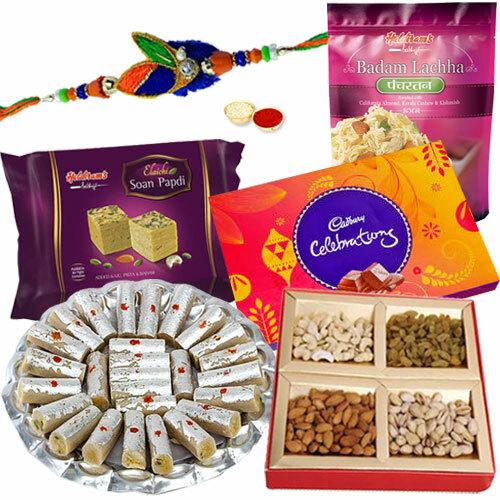 Haldiram Badam Lachha, Cadbury Celebration, Shoppers Stop Voucher worth Rs. 250 and 1 Fancy Rakhi. A little change in Rakhi design might occur.